Proudly on offer today is an oriignal breitling top time chronograph wristwatch with original so called 'reverse panda dial' black dial with white subdials. 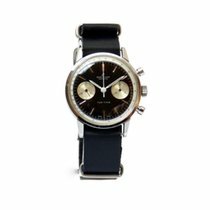 A mechanical manual winding slightly oversized watch at 38mm in stainless steel model 810 case. Fully signed breitling on case dial and crown. Dated 1966 and possess the famous venus 178 caliber as does its pilot brother the navitimer. The vintage leather racing type strap really finishes off the look and also comes with a later Breitling buckle. The watch comes fully serviced via our onsite workshop along with 12 months non waterproof service cover. 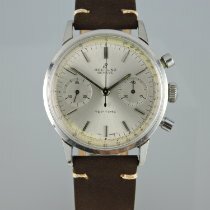 The first Breitling Top Time 810 (Mark 1.1) debuted in 1966 with a Venus 178 movement and was made for roughly a year. This was a 38mm monocoque case (top-loader) made by EPSA and it came in 2 variants. The first was a black dial reverse panda layout with applied lume at the hour markers.